Recognized for its scholarly contribution and real-world application, the faculty and students in the Department of Psychology form a tight-knit and academically intensive community. 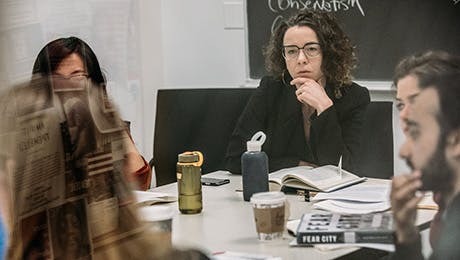 Based in New York City, with research and understanding that affects policies and people around the world, the department contributes to a tradition of psychological scholarship sensitive to social, cultural, and political concerns. At the master's level, the Department of Psychology offers a program in general psychology that provides students with in-depth training in all the major fields of psychology. After students complete their master's degree, there are two doctoral programs to which they can apply through a separate application process: either the PhD in Cognitive, Social, and Developmental Psychology (CSD) or the PhD in Clinical Psychology. We promote an interdisciplinary approach to psychological issues and foster interaction between the CSD and Clinical Psychology programs. PhD students are free to work with faculty from either area. In the MA program, students have the option of using their elective courses to take the three courses that comprise the Concentration in Mental Health and Substance Abuse Counseling. These courses satisfy the academic requirements to qualify as a licensed substance abuse counselor, after completing the required hours of supervised externship credit. At the master's level, the Department of Psychology offers an MA program and two PhD programs. Psychology courses pair historical theory with modern research, enhancing our understanding of the way we think with the way we live now to improve our understanding of a modern world. Specific courses are oriented to the most important - and most misunderstood - issues of our time, like child abuse, drug abuse, terrorism, trauma and memory, music and the mind, gender identity, as well as thorough training in quantitative and qualitative methods.